KWICis is meant to complement DoubleTreeJS. Double Tree is a visualization component targeted to support exploratory corpus analysis, with particular focus on analyzing concordances. Slash/A is an ngram viewer for corpora with dated documents. It’s a tool created by two former students of mine: Slava Todorova and Maria Chinkina. Corpus Clouds is a novel interface to a corpus query engine, with the aim of aiding the user in exploratory search by providing, in an easy to comprehend visual form, information about the frequency and distribution of the search results in combination with the standard KWIC elements. 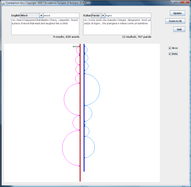 Comparison Arcs is a proof of concept of a way to compare linguistic properties of multiple documents by means of graphical displays. End to End is a visualization component targeted to exploratory corpus analysis with special focus on analyzing collocations.